There is something about perfectly ripe peaches that just make you want to pair them with cake. Well, this recipe does just that in a few simple steps! 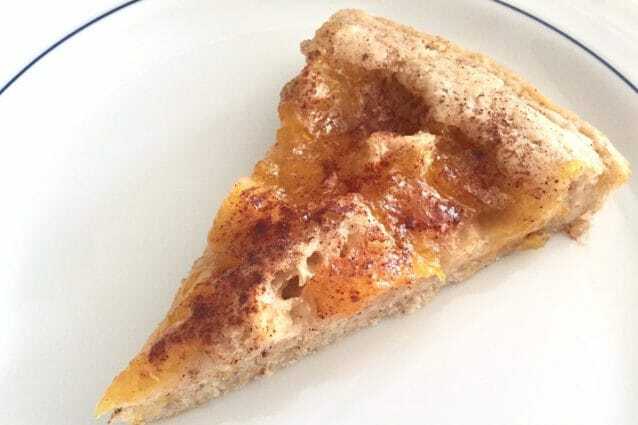 While peach cobbler is usually considered a dessert, it can certainly pass for a great breakfast cake as well. 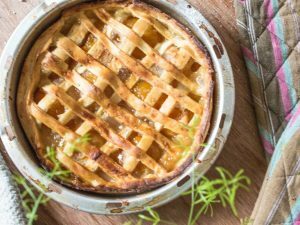 By cooking the peaches in this recipe, a delicious peach syrup is created which is then baked into the cake giving it even more peach flavor. Melting the butter into the pan (rather than adding it in the batter) will create a crispy edge on your cake that is just irresistible. 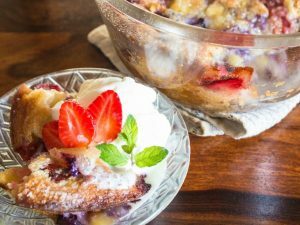 The best part about this recipe is not how delicious this cobbler is but how quickly you can throw it together! So start peeling your peaches now and you will be eating peach cobbler in under an hour! Place the peaches in a small saucepan along with the sugar, water and vanilla and bring to a boil. Allow the peaches to simmer for about 10 minutes or until they are soft and the syrup has thickened. Turn off the heat and set aside to cool. In a medium size bowl, combine the flour, baking powder, salt, sugar, milk and cinnamon for the cobbler batter. Whisk the cobbler batter until there are no lumps. Melt the butter in an 8 inch round cake pan or whatever pan you are going o be baking the cobbler in. Pour the cobbler batter into the cake pan on top of the butter. Spoon the peaches into the pan as well making sure to distribute them evenly. Sprinkle the top of the cobbler with cinnamon and sugar and put the pan into a 350 ̊F oven for 25-30 minutes or until the top begins to brown and the sides of the cobbler are pulling away from the pan. Allow to cool then slice and enjoy!